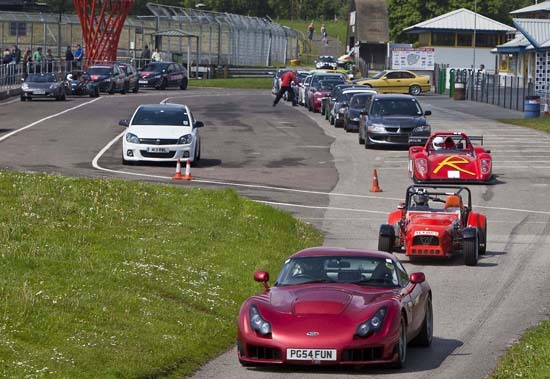 Anticipation, exhilaration, the sound of engines being exercised, and the satisfaction of being able to get the best out of a car – all to be enjoyed at track day events like this one at the Castle Combe circuit in Wiltshire. It’s been a while since my very first track day, a day that completely changed my mind about motor sport (and indeed my life, but more of that later). So when I was asked to write this feature I decided to take myself along to a track day and accompany a novice, to see through his eyes how it all began for me. 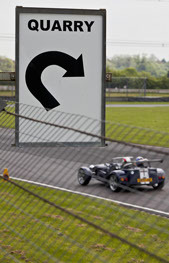 On arrival at Castle Combe, clear directions help the newcomer. 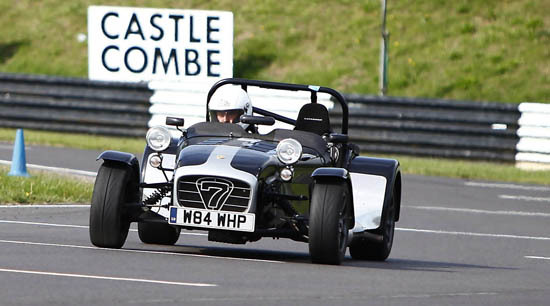 Our circuit of choice is Castle Combe, located in the heart of the Wiltshire countryside, and previously an airfield. 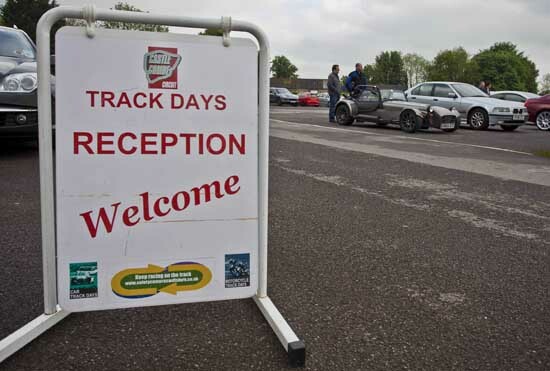 It has hosted motor sport events since 1950, is a regular location for the likes of Top Gear and Fifth Gear, and on a gloriously sunny day in June is the perfect venue for my track day novice Jack’s adventure. 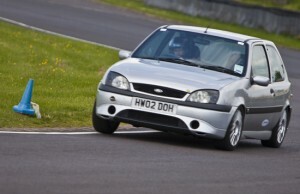 Despite being one of the fastest circuits in the country, Castle Combe is ideal for the novice track day driver. 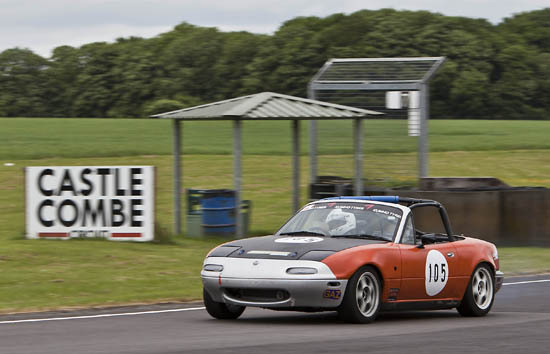 It can be challenging, thrilling and extremely satisfying in one lap, and as we will see, the team at Castle Combe track days look after their novices. 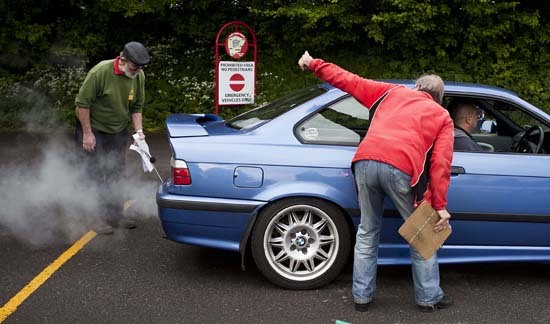 Some preparation is required before your first track day, starting with your car. Can it handle being pushed to its limits on track? Are you happy it is running well, is mechanically sound and that tyres and level checks are satisfactory? Registration is a straightforward process. Secondly you will need a safety helmet, not necessarily FIA approved, but one that will provide adequate protection without jeopardising your driving view. Full face is more comfortable for open cars, and open face is easier if you are going to be communicating with an instructor in the car. Either way the best you can afford is usually advisable, although some circuits will hire you a helmet if you don’t want to go to the expense of owning one just yet. No need for gloves unless you want to, but shoes with a thin flexible sole are useful for you to get the best feedback from the car and for overall pedal control. However, a standard requirement on all circuits is that arms and legs must be covered at all times on track – a bit of a bind on a lovely sunny day in June, especially when temperatures inside the car become tropical, but no sleeves, no drive! Finally insurance. 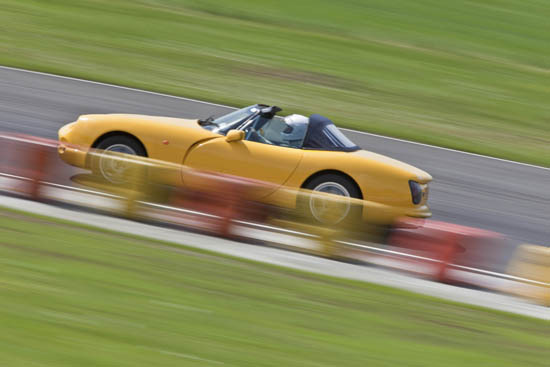 Be aware that the policy for your road car will not cover you for any damage incurred on track so you need to take out separate track day insurance from a specialist insurance company – if you want cover. This can be booked by the day, or for a number of days throughout the year, but must be arranged in advance. However, in my experience most participants choose not to take out insurance as it can be expensive, with a high excess commitment. Unless you are driving a very valuable historic model of car it is a risk most are prepared to take – but ultimately it is your decision. On arrival at the circuit we note an array of cars, the usual Caterhams, Fiesta STs peppered with the odd Radical and Atom. 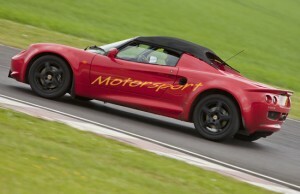 It’s going to be a busy day and our weapon of choice today is a Lotus Elise S1, road and track legal and a great drive. 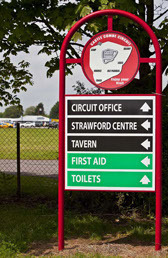 Registration is carried out in the eatery that is “The Tavern” and includes producing our driving licences for inspection, and confirming the number of drivers for each car, plus we are given a noise test slip to take to the scrutineering bay. The noise test is mandatory for all cars on the circuit and you cannot enter the driver briefing without confirmation this has been done. It’s a simple procedure whereby the driver revs the engine to approximately 4000 revs (depending on the car – the scrutineer will advise) and the noise meter then detects the dBA (decibel) level, which is then recorded. 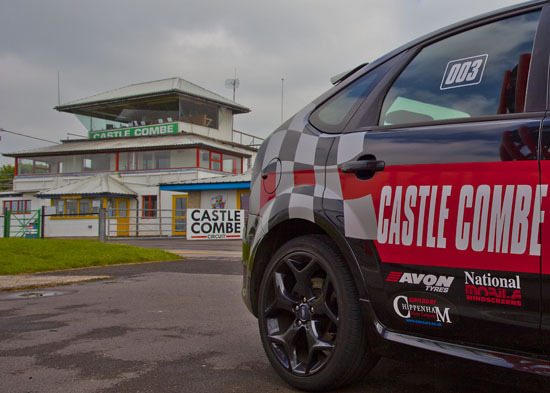 The maximum allowable dBA level for Castle Combe is 100; most road cars are well within this limit but circuits vary, so when booking it is always worth checking what is the limit for the track day. Our noise test is successful at 86 dBA, so our Elise is now adorned with a sticker confirming this, plus our noise test slip is signed and ready to be handed in at the driver briefing. Established over 60 years ago, the Castle Combe circuit has good facilities, and is renowned for being a friendly place for event participants. Whether a newcomer or a long-standing track day driver, everyone is welcome. Noise tests are mandatory… The car must pass to be able to take part. 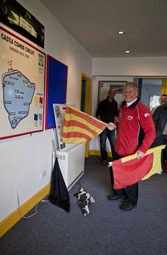 During the briefings, the layout and idiosyncracies of the circuit are explained. Track day novice Jack takes to the wheel under the watchful eye of his instructor, who will help to ensure that Jack makes the most of his time on the track. 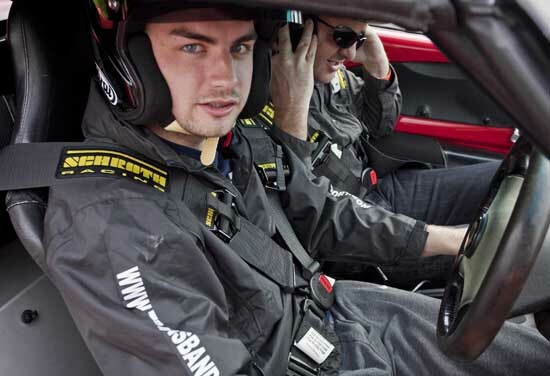 Familiarisation laps in the circuit’s own vehicles are an important part of the learning process. Here Jack is learning to control the car and to take the most effective lines through the bends. Here cars are queueing to join the circuit. It is compulsory that all drivers attend the briefing, no matter how well they know the circuit, and how many years they may have spent racing in prestigious championships, EVERYONE must attend. Safety First! The compulsory briefings are given by experienced staff who want to ensure that people taking part stay safe and enjoy themselves. 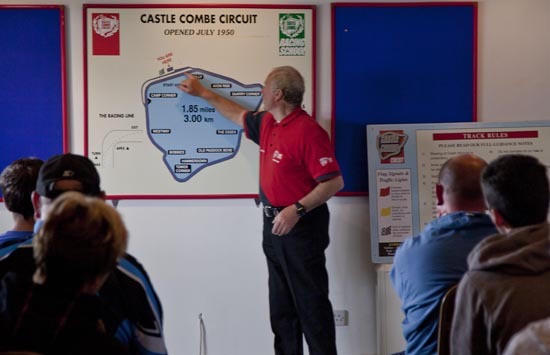 Our briefing today is conducted by the entertaining Castle Combe regular David DaCosta. His pitch is light hearted but covers circuit safety protocol in depth. He explains the overtaking rules (unusually on the left at Castle Combe due to the location of the pit lane entry onto the circuit), communication by flags – red for stop, yellow for obstruction, black for mechanical problem/poor driver etiquette and finally the iconic chequered flag for session end. He also mentions the cones that have been placed on the edge of the track to indicate potential braking, turning and apex points. There are also a couple of timely reminders about loose kit in the car being dangerous out on track, and he asks us to ensure all cameras are fixed in a suitable clamp. During the briefing any novice drivers or those new to Castle Combe are asked to remain behind, and they receive some useful hints on how to get the best out of the circuit, plus valuable information on how to tackle the infamous Quarry Corner, Castle Combe’s most accident prone corner. Once our additional briefing is completed we are issued with armbands which will now give us access to drive on track. These armbands must be visible to all marshals in the pit lane. Plus we are offered the opportunity to do some familiarisation laps in car with a Castle Combe instructor, who talks us through the best driving line to practice and points out the relevant braking and turning points. This is very useful and much more informative than the usual sighting lap, whereby you follow a safety car in your own car. 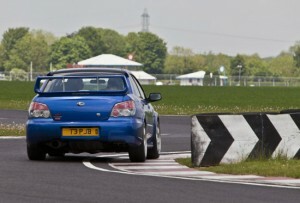 Castle Combe also offer free instruction on their track days. 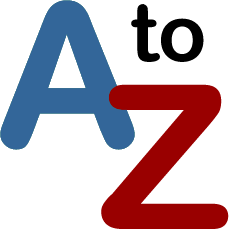 This is invaluable to the novice and is rare to be included in the price of the day, since usually instruction is charged at £25 per 15 min session. All of today’s track day drivers are divided into groups depending on their experience and ability, from novice to advanced. Only one group is on circuit at any one time, this means you are on track with those of similar driving skills to you, which is a big plus if you are a little nervous. The sessions are for 15 minutes track time, which doesn’t sound a lot but is plenty when all your powers of concentration are continuously at play. Instruction, instruction, instruction is the order of the day for the novice, but indeed everyone can learn something from an instructor who knows the circuit well. 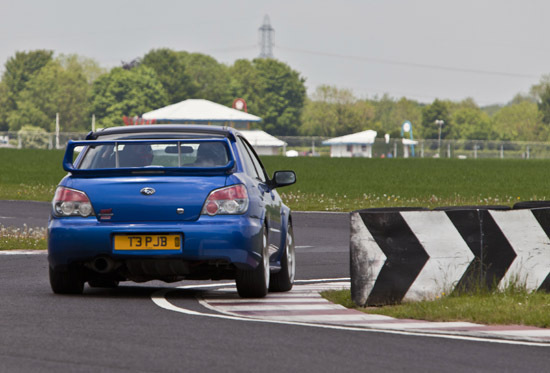 Whilst we all think we are excellent drivers we can still learn more and add to our track day driving skills. My novice on the day Jack has been driving for over 7 years and has enjoyed the use of several powerful cars accident free to date. However, he has to learn a whole new style of driving to get the best out of his Lotus Elise on the circuit. 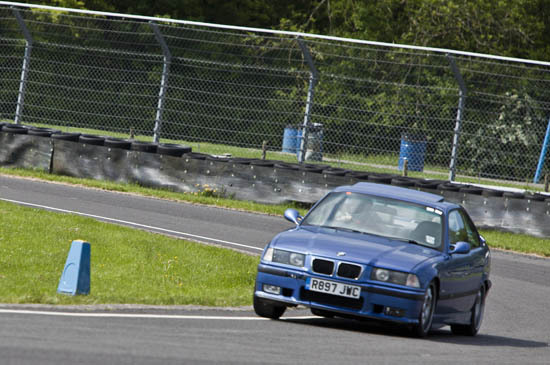 Our instructor is another David who has competed successfully in the Castle Combe GT championship for many years. He therefore knows every kink and camber in the circuit, and the thrills it will give up with encouragement. After his familiarisation laps with other participants Jack is ready to go. 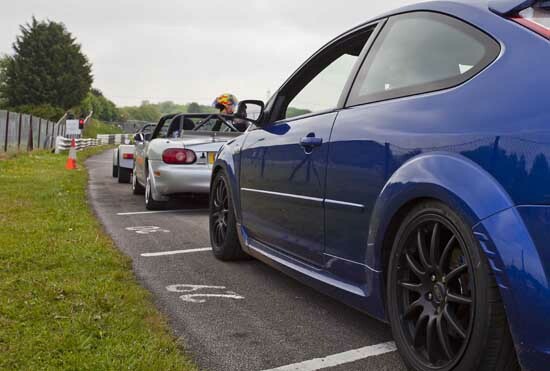 He joins the queue for the novice session and waits nervously in his car for his track time, with David in the passenger seat reiterating the briefing do’s and don’ts in readiness for when the red light turns green. The first few laps are driven at a speed Jack is comfortable with. Whilst the tyres are warmed for better grip he endeavours to learn the correct driving line and act on the cones when he sees them. It’s a lot to take in; he needs to drive, concentrate, listen and act on David’s instructions all at the same time. The first session is over and an exhilarated Jack returns to the paddock. Tyre pressures are checked and a quick debrief by David gives Jack the heads up on what he can improve upon next time. In the next session Jack flies solo and does his best to put into practice all that he has been taught earlier. It’s not easy but the sense of achievement you feel from getting the line correct approaching a chicane, resulting in a seamless sweep with car and driver in perfect harmony, is exhilarating. The key is to relax and let the car give you the feedback for you to act upon, which is far easier said than done on your first track day. The day unfolds for Jack with a combination of driving alone on track perfecting his new found skills, and being accompanied by David who continues to give him support and iron out a few issues where Jack is struggling, for example the best entry speed at Quarry corner. It is important that instruction is sought at the beginning of the day to enable you to practice the best line. It is no use struggling to get the best out of a corner to find, once you have sat with an instructor, you have been approaching it from the wrong turning point all day. One simple tip from a professional can make such a difference. ‘Traffic’ cones are strategically places around the circuit, helping drivers to judge their braking, turning and apex points at corners. 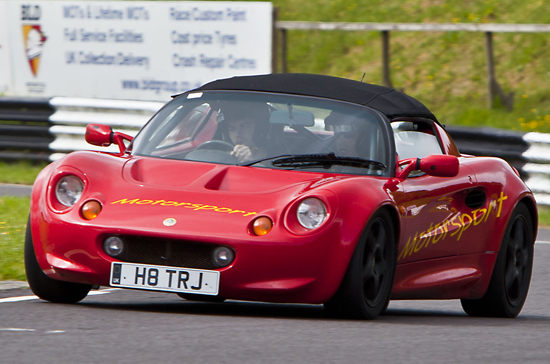 For the first time, track day novice Jack drives ‘solo’. Many types of vehicle take part, adding to interest on the day. More about vehicle choice in a separate feature soon to come to ‘Wheels-Alive’. Quarry Corner at castle Combe needs to be treated with respect; full instruction is given on how to tackle this famous bend. When I was first on track I did find it a bit overwhelming, and was advised to just practice one corner at a time. 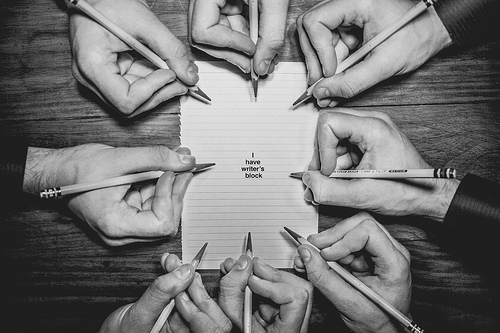 Once you’re happy with it move on to the next and so on, then link them up together for the best lap ever! It is such a rush when you get it all right – the perfect lap can be achieved with practice and then you are ten feet tall, beaming from ear to ear, what a feeling! 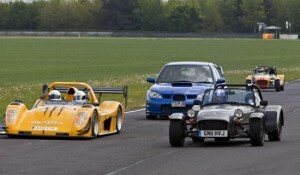 Track Day Cars – which will you choose? Whether you choose to thunder around a circuit in your everyday mode of transport or invest in a dedicated “track toy” is entirely your decision, and your choice is often necessarily a balance between budget and practicality. What follows is by no means an exhaustive list of track potentials with suggested purchase prices for used models, that will give you something to think about. 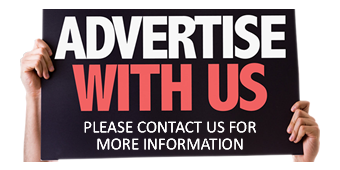 Depending on your requirements, my aim is to hopefully help you narrow down your options for further research. The iconic MX5 is light with excellent rear wheel handling. The 1.6 litre engine offers a potential 114bhp in a car that weighs less than a tonne and its performance is impressive. If looked after properly these cheeky little cars will provide hours of fun at very little cost, and are a favourite for novices and advanced track drivers alike. Big competitive grids prove they are also a popular and affordable race option, but more on this at a later date. A top contender for a combined road and track driving option. 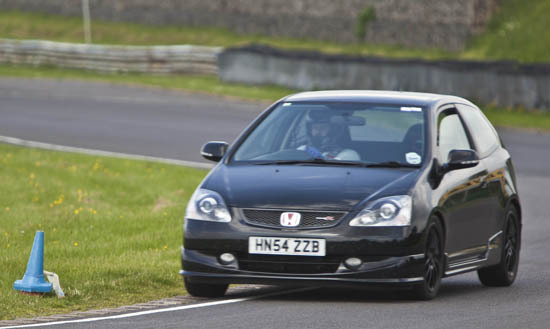 The lightened and stiffened body, upgraded chassis and brakes coupled with the powerful, super reliable V-TEC engine means trouble free fun is the order of the day for the Type R enthusiast. A great performer on track offering a hassle free, no tow, ‘drive home when you’re done’ experience, plus Barrichello impressions on circuit. A cheap price for a lot of fun. This iconic BMW model is a proper performance car, developed by the company’s motorsport division is as happy on track as it is on the road. BHP statistics hover around the 300 mark on the early 3 litre models, proving you can buy power on a budget. Whilst typical road running costs like insurance can prove costly, this car still represents value for money as a track car that can be used regularly on a day to day basis. This four wheel drive Japanese piece of perfection rewards you with a sensational drive whatever the weather. Its array of technical toys ensures that wet or dry this car will not disappoint. Ideal for those unpredictable track day forecasts or as an all year round option for road and track. The range of models varies widely in spec. so some research is required to get the best value option to satisfy your track and/or road needs. A British legend comprising a stylish lightweight fibreglass body encompassing a throbbing V8 engine. With little in the way of assistance from traction tools, this one is not for the novice. The Chimera is a popular option for the more advanced driver, who is also happy to maintain this car’s often temperamental workings. The musical V8 may prove too noisy for some circuits but silencers are easily sourced to overcome this if required. This quick beast will put a smile on your face for days. 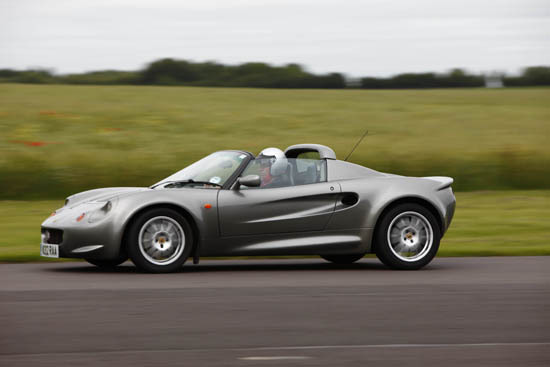 The performance weight ratio successfully balanced by Colin Chapman (Lotus founder) remains for me one of the most exhilarating track drives that a car of this price bracket can offer. Its minimal trim and the agility required to enter and exit the cockpit may prove too much for everyday use but on track it comes into its own. The earlier S1 models sport a 1.8K Series Rover engine with the later S2 models offering the more reliable Toyota option. Be warned – once driven you’ll be bitten by the Lotus bug! It can be very satisfying as well as fun to build your own car. What a feeling to harmonise on track with a machine built by your own fair hands. 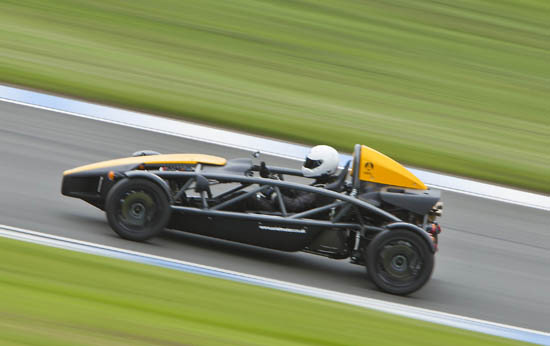 Alternatively you can buy a Caterham factory built example if you prefer. Either way visit any track day anywhere and you will always be blessed with the sight of these incredibly quick and agile cars in abundance. Their mosquito like stance proves that with skill they can outwit many a supercar on the chicanes. The Caterham’s continued popularity also ensures they retain their value and their light and simple structure is easy to maintain. An absolutely thrilling drive as endorsed by the celebrity facial contortions of Mr Clarkson himself. This lightweight car hit the track day scene in the late 90s and has gained in popularity ever since. The Civic Type R engine coupled with a car weighing less than 456kg proves phenomenal. Its distinctive skeletal design and bomb proof engine offer little in the way of maintenance issues. 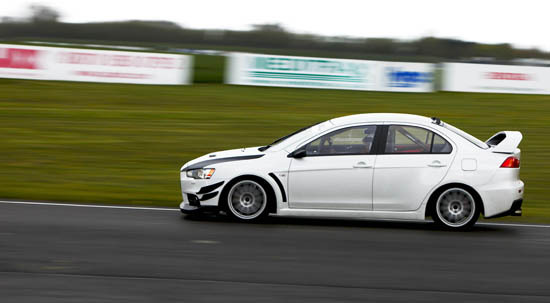 Who could resist the opportunity to own an exclusive marque and true track day toy? 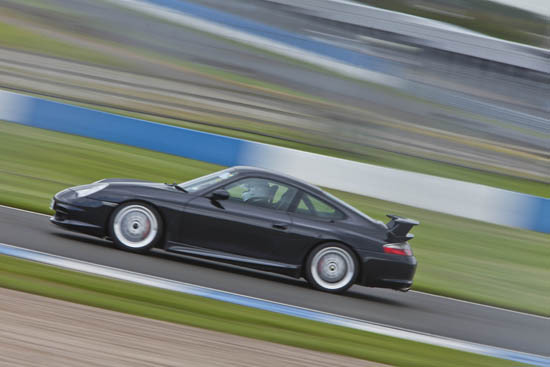 What track day line up would be complete without the track car royalty that is the Porsche GT3. The fifth-generation Porsche GT3 made its debut at the Goodwood Festival of Speed recently and it did not disappoint. An outstanding product of Porsche’s racing department, its breathtaking ability to entertain the most hardened of thrill seekers is epic. Since the launch of the Porsche 911 in 1963, over 820,000 examples of this elite sports car have been produced and it continues to please. So if budget is not an issue then this has to be your chosen missile, you will be the envy of the paddock. As previously mentioned these are just a number of potential weapons for the track day battles of driver versus speed thrill. Track days are fun for all budgets but you are warned that once hooked you will justify any tempting upgrade as essential track day maintenance. Next time I will be offering advice on how to prepare your chosen car for an exhilarating day on the circuit, plus some hints on essential checks and helping to ensure your track day runs safely and smoothly.